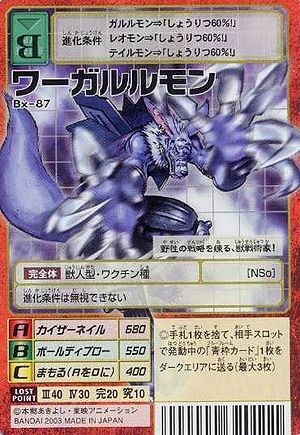 Battle Type Evolution Requirements Garurumon + Winning Percentage: 60%! Leomon + Winning Percentage: 60%! Tailmon + Winning Percentage: 60%! This beast tactician refines its wild strategies! The evolution requirements cannot be ignored. ◎For every card you discard from your hand, send one of the opponent's currently activated blue frame cards in their slots to the Dark Area (3 cards max). This page was last modified on 3 December 2016, at 21:33.